As we recently reported in MDPI’s Publications, our sample of DOAJ journals charging APCs showed a skew in size of publisher with journals in this category. Most journals were published either by publishers with 50+ journals using APCs, or 1- 9 journals using APCs, with not much in the middle. 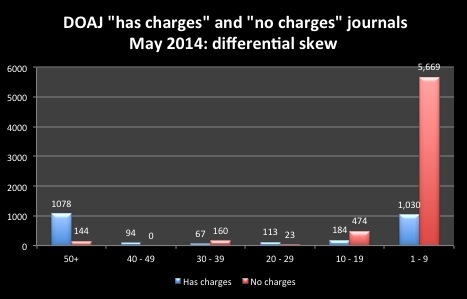 To prepare for our next study we are drawing a small sample of the much larger set of DOAJ journals with “no charges”. In preparing for this stratified / random sample we stumbled upon a different skew for this set of journals, that is, a very large skew towards the very small journals but no skew towards larger publishers. The chart above illustrates this difference in skew. To express this in plain language, what we are seeing here is a very large number of open access journals with no article processing charges (5,669 journals or 88% of no-charges journals) published by publishers with less than 10 journals in this category. The relatively small percentage of journals that do not fit in this category are spread somewhat evenly between the other size ranges.